The news was updated on April 11, 2019. “I downloaded an app, clicked ‘find a restroom’ and then these just came up with pictures of nearby public restrooms, numbers of available toilets as well as maps showing how I could get there,” Qian said. She then chose to go to the nearest restroom. After entering the restroom, she scanned a QR code on a tissue box which dispensed toilet paper for free. “It’s brilliant! It helps avoid waste and solves my problem so quickly in a way that I’d never thought of,” she said. Qian was visiting the Old Town, a famous UNESCO World Heritage Site with an 800-year history in the city of Lijiang, Yunnan province. It attracted more than 14 million tourists last year. “The Old Town is so charming. I love it, especially its fabulous lavatories – I even took pictures with them,” she said. All 30 public restrooms in the Old Town are two-story buildings with traditional characteristics of the Naxi, the native ethnic group. Two LED screens hang at the entrance of each restroom to designate both the men’s and women’s restrooms as well as a unisex room. The screens also display the temperature in real time, humidity, and the concentration of hydrogen sulfide and ammonia gas. 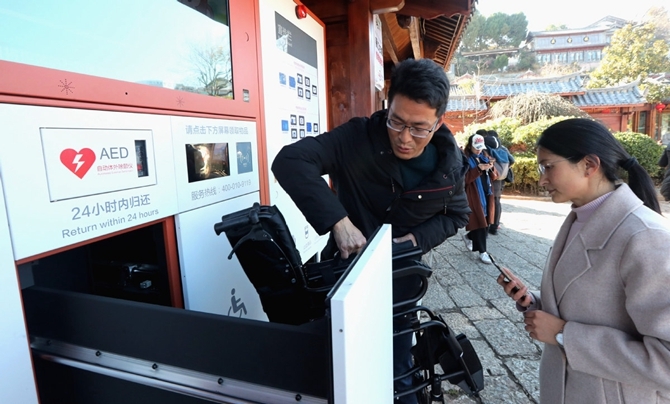 “You can check the availability of toilets on the screen,” said He Tang, a senior official with the protection and administrative bureau of Lijiang Old Town. “We use simple figures with numbers below to represent each toilet on the screen. Red means it is occupied while green means it is vacant,” he added. According to He, a deodorizer system has been installed, and real-time monitoring of hydrogen sulfide and ammonia gas on the LED screen reflect the air quality of the restroom. “Lavatories are related to our most basic needs. We want to give visitors a five-star experience in the Old Town, and public restrooms cannot be left out either,” he said. Since 2015, local authorities have invested more than 20 million yuan ($3 million) in renovating and maintaining public restrooms in the Old Town. Urine data such as sugar level is expected to be introduced in the future. These public restrooms are the epitome of the ancient city’s digital development. There are 380 high-definition cameras working 24 hours a day in the Old Town to monitor public security and fire safety – video footage of which is accessed by local police stations and fire stations. “Facial recognition will be added into the system within the year,” He said. 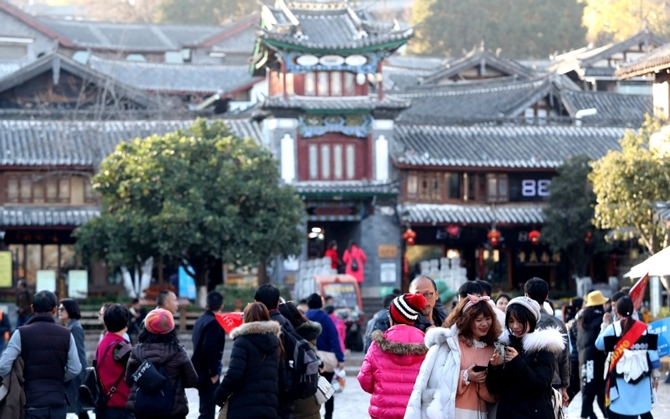 The monitoring system could also indicate real-time visitor numbers so tourists can easily check whether the scenic area is crowded on 13 digital information screens in the Old Town or on its official WeChat account. Two first-aid stations have been in operation at the Old Town since last year. By scanning a QR code or an ID card, one can get automated external defibrillators, stretchers, wheelchairs, bandages and other medical supplies for free. Meanwhile, local authorities have implemented a noise-control system which will cut off electricity at a bar if its noise level exceeds 85 decibels ten times. “Digital integration is an inevitable trend, and it could make the ancient city more attractive and contribute to the sustainable development of its tourism industry,” He said.